Getting to know the elements if important no matter which path you are on. From Wiccan to Shamanic traditions, all rely on the elements at some point for their work and for their guidance. Take some time to get to know the elements and your work will be richer for it. If you have never done any type of elemental magick, start slow. Visualizations and meditations are the best way to start. I would recommend working with one element for a full moon cycle before moving on to the next one. Start with Earth and move clockwise – so Earth, Air, Fire and Water. * Water (that one is obvious) for water. * Earth – Go to a park or a secluded area for Earth – somewhere where you can sit and have direct contact with the earth. If you can have your back to a tree even better. I went to different parks around the city and even brought home some leaves and soil that I used in meditation. * Air – I picked a very windy day to go out to a very open park. I just stood there and felt the wind rush by me. You can almost lose yourself in if and feel it infuse every element of your being. I also went out in a thunderstorm a few times. Try to spread it out and feel every aspect of Wind – from the most pleasing calm gentle breeze to the strong and scary winds of a storm. * Fire – this one was tricky. I ended up lighting 9 votives on my altar side by side (in votive holders of course). I meditated in front of it and after a while, I could feel the heat of the fire, the flicker of the flame even with my eyes closed. I recommend not trying to touch it – just reach out with your mind/energy to feel the element close to you. You can do this with candles, if you have access to local festivals you can attend one with a bonfire. This one was the most difficult for me and took the longest. * Water – I did a herbal bath for this one – if you live by the water, go out into the ocean. If you live by a lake, go for a swim – even a swimming pool can work for this. Go out in a strong rainstorm and feel the water coming down on you. I also watched some rather scary documentaries of rivers overflowing, and the oceans invading beaches during a hurricane. 3) Be patient. It will take you varying amounts of time to “connect” or be able to “feel” each of the elements. It took me about a month for earth, about 6 weeks for Air and 6 months for Fire! I feel now that I was born with a connection to water, as it took me no time to “connect” with water – that one was instant. But the point is you may find that you connect with certain elements better than others. This is something only you can know. For years I was told that I had a connection with earth, because I was an earth sign, because I enjoyed working with herbs but in the end, that was not true. It is critical that you start with an open mind. I have seen in the past people want so hard to have a connection with one element over another that they end up blocking their connection to all of the elements because of it. Open yourself up – keep an open mind and you will be amazed at the results. 4) Don’t use spellwork. You are not trying to cast a spell to connect to the element – you are trying to find YOUR connection to each element. This is not like a spell – its personal – its a journey. There is no quick way around it, there is no insta spell that will automatically connect you with the elements. This will take work and most of all time – but the results are well worth the effort. Some may ask why this is important? The elements exist in every aspect of life and magick. Every spell you ever work will be ruled by one element or another – in every aspect of your daily life you will encounter one element or another. It is important that you build strong relationships with the elements so that you can call on those energies easier whenever you need them. Once you build that connection – all you need to do is close your eyes, focus and there it is! Remember that the elements are not spirits or beings – they are energies – all you have to do is tap into them and create a window for yourself. What you will find is that once created, that window will exist forever and anytime you need it, you can just open it and find that connection! This is a complete listing of the Sabbats – broken down by Month. This guide is available on our online BoS and I wanted to include it here as a reference. Enjoy! Carry Elements in your pocket! With our newest kits, you can now keep the elements in your pocket! 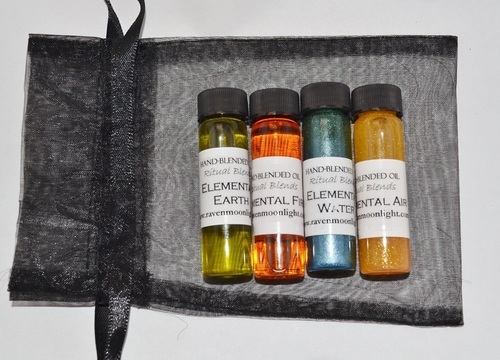 Our little elemental blend sets are perfect to have on hand for all types of spells! You can choose incenses, oils or both! You can order these little beauties on our online store here or pick them up in store!